The RH5D and RH7D are child size, anthropomorphic hand models with opposable thumb control. Both models have the same external dimensions and design and the internal electronics are also the same. FOr this reaosn documentation for both models is combined. The difference between the two, is that the RH5D lacks the Wrist flexion and Wrist Adduction Degrees of Freedom (and the corrsponding actuators). 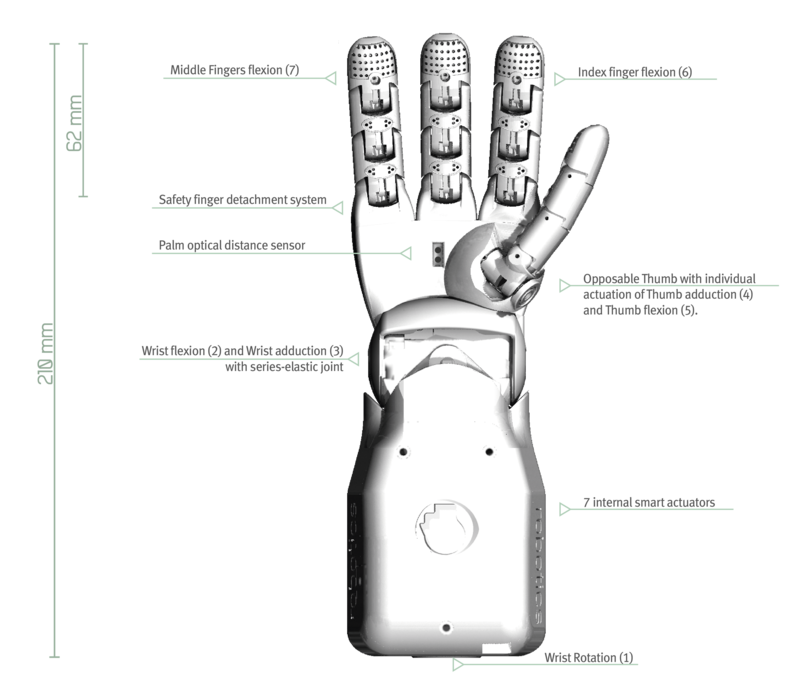 The RH7D has these Degrees of Freedom and as such offers a full spherical wrist joint. The Knowledge Base is in continuous evolution and growth. If there's anything you need, that's not yet covered here, please email us through support@seedrobotics.com and we'll be happy to assist you. Legal notice: Seed Robotics makes the 3D CAD files available to its customers only (entities who have purchased or ordered Seed Robotics products), for the sole purposes of building simulations and assessing dimensions and mechanical characteristics. Seed Robotics retains all Copyrights and Intellectual property rights pertaining to the material hereby being distributed and does not make any warranty as to its accuracy or fitness for purpose. The publishing of this material, does not constitute a waiver of any of Seed Robotics copyrights and intellectual property rights and does not grant the user any distribution, transfer, ownership or any other rights other than ones explicitly authorized in this notice.